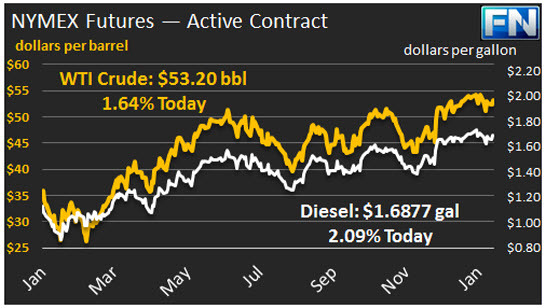 WTI crude prices have risen above $53/b this morning. WTI opened at $52.55/b today, a drop of $0.50, or 0.94%, from Friday’s opening price. Last week, WTI closed in the red, dropping from $53.75 at Monday’s opening to $52.37 at Friday’s close. 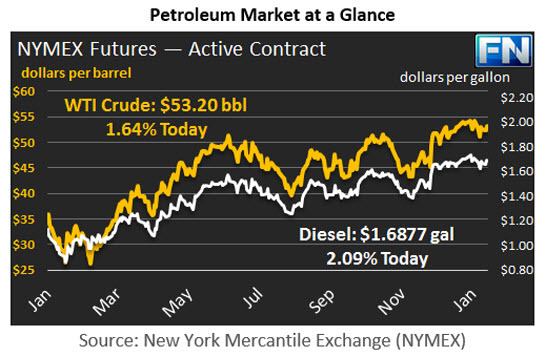 Current prices are $53.20/b, $0.83 above Friday’s close. Yesterday was a quiet day because of the Martin Luther King Day holiday, but buying interest emerged as the market formally opened. OPEC news is supportive of prices today. Saudi Arabia reported that it has already cut production below 10 million barrels per day. Saudi Oil Minister Khalid Al-Falih was quoted as saying that many countries are “going the extra mile” to make deeper cuts in production. OPEC believes that the current program of cuts will eliminate the global oversupply this calendar year. This assessment is being made even with varying definitions of “compliance” with the cuts. Because OPEC countries do not operate as a truly unified cartel, many believe that 50% to 60% compliance with planned cuts will be sufficient. Perhaps 50% compliance is the new normal? Prices have also received some support from a weaker U.S. Dollar. The President-Elect was quoted as saying that the Dollar was already too strong, and the Dollar quickly declined against its ten major peer currencies. The Dollar is expected to show volatility during the transition to the Trump presidency. Distillate opened at $1.6526/gallon in today’s session. This was 2.32 cents below Friday’s opening price. Current prices are $1.6877/gallon, up by 3.63 cents from Friday’s closing. RBOB opened at $1.6287/gallon today, down 0.70 cents from Friday’s opening. Prices have come back to $1.6458/gallon today, up 3.41 cents from Friday’s close.